Manufacturers of microtubes do not recommend storing them under cryogenic conditions because of the potential of liquefied nitrogen seeping into the tube through the cap. Current methods manually encase the entire tube in a heat shrink tubing using a heat gun. The CryoProof 313 is an innovative and patented tube sealer that automatically heat shrinks a short plastic tubing to seal only the cap of a cryogenic tube, and assures a leak-proof seal in seconds. 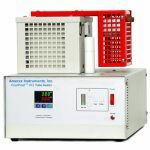 The seal reduces the potential loss of valuable the samples during cryogenic storage arising from very cool air or liquid nitrogen seeping into the tube, or the release of hazardous samples from the tube.